Another Christmas on Nantucket finds Winter Street Inn owner Kelley Quinn reflecting on the past year as he writes a holiday letter to friends and family. Though the year has had its share of misfortune and worry, the Quinns have much to celebrate. Kelley, now single, at least is on better terms with his first wife Margaret, who is using her celebrity to lure customers to the inn in record numbers. Their son Kevin has a beautiful new baby, Genevieve, with the Inn's French housekeeper, Isabelle; and their daughter, Ava, is finally dating a nice guy--her devoted colleague, Scott. 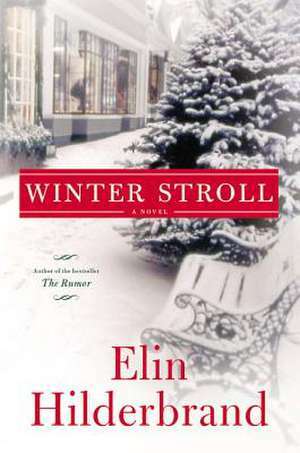 Elin Hilderbrand has spent Christmas Stroll weekend on Nantucket since 1998. She enjoys attending the annual Festival of Trees preview party at the Nantucket Whaling Museum and the Friends of Nantucket Public Schools Holiday House Tour. Her other favorite holiday traditions include making cheese fondue and decorating the tree with the help of her three children. Winter Stroll is her sixteenth novel and the second book in the Winter Street trilogy.